It's been a ghost town here for more than a month but I assure you I've been busy. Let's start one project at a time though! A while back the lovely Katryna of Boots & Cats (seriously love her blog!! So much sewspiration!!) contacted me about making some ballerina-esque tulle skirts for herself and the equally awesome Marielle. They're part of the Lux Beauty Boutique team - a great little gem on Edmonton's High Street selling all kinds of lovely skin care and cosmetics. You can read their blog about the skirts here. The inspiration for the skirts was initially a dip dye concept but once we hit the fabric store and started looking at the materials available they decided that a two-tone skirt would be equally cool. I have to agree! Katryna selected a navy and a blue-grey in which I altered the layers to go navy-grey-navy-grey and so forth. Marielle selected a lighter grey with an aqua/sea-foam colour. For hers, I put a few layers of the sea-foam closest to the lining and then layered a ton of the grey on top. These tulle skirts ended up being quite the learning curve of a project in more than just technical skill which, in the end, I'm very glad for. I've never worked with tulle before and considering I don't actively work with a lot of delicate fabrics I'm oddly not shy about taking them on. Most of the time with a little patience you can get them to do what you want. However, as I learned with the waistbands some materials just aren't suited for certain things. More on that further down. The problem with tulle though is that it's a thin little bugger. I totally under estimated how much material was needed on our initial fabric trip excursion. When I got home and got things started I only had enough for 3-4 layers each which, in any other fabric weight, would be TONS but with tissue paper thin tulle.....not so much. The gals were super understanding though and once I had calculated how much was required per layer they picked up a few (A LOT) more meters. We were also at a disadvantage because we could only find 45" wide tulle. 60" would have been far more ideal but our city didn't seem to have it. This meant more meters were required and that there would be some unavoidable waste as the pattern pieces were laid out and cut. Thankfully tulle is one of the most inexpensive fabrics you can buy....you just need a lot of it to get some substance. Speaking of substance.....LOOK HOW FLUFFY they are!! The drafting of the skirts was pretty easy. I referred to my trusty pattern making bible and drafted a circle skirt pattern based on their individual measurements. I drafted half the circle but ended up having to fold it down to a 1/4 to actually mark the fabric. Circle skirts are a super easy draft to do if the concept of π doesn't frighten you and you have generous table or floor space. My drafting table is 30" by 60" and it handled the task just fine. It was a little awkward but certainly manageable. And there are tons of free tutorials online on how to calculate them if you don't have any pattern making resources kicking around the home front. 1/4 of my circle skirt pattern with layers of tulle stacked underneath it. I was hoping to have only two side seems and to sew the zipper into one of the sides but due to the narrow width of the fabric my half pattern piece would not fit width wise and was far too wasteful lengthwise. I folded it into a quarter and got super crafty in how I stacked and folded back the fabric. I did not want to waste more than I had to, and in order to maximize the fabric I had to have a back seam instead of two side seems. This meant one 1/2 piece along the front and two 1/4 pieces at the back for a total of 3 pieces/3 seams to each layer of tulle. It just looked cheap to me. Having so many layers stacked up with this type of seam wouldn't have looked right. On to plan B and something I did not anticipate having to do when I began this project; the French seam. It's the seam so nice you sew it twice! It's used for delicate fabrics such as this. Instead of sewing the fabric right sides together you start by sewing them wrong sides together, turn it out, trim and press, then sew that seam again but this time right sides together. It ends up making a sort of casing on the inside of the fabric but is far more delicate looking than an overlock stitch and a lot nicer than just leaving the raw edge exposed. 3 seams x 17 layers of tulle (Marielle wanted her's on the fuller side so she got a few extra layers) x 2. This definitely added to the project time and my initial estimate of 3-4 hours per skirt in sewing was grossly underestimated. Oh well. I hadn't actually used this skill set since school so it was good to dust it off and put it towards something other than a sample. AND because you can't press tulle (it will melt if you do) I got to skip that step and just trimmed as required. I do feel like my seams could have been even more narrow once all was complete but the finished product did end up having a less visible seam and I know for next time that I can be much more generous with the trimming. The seams ended up being about 1/4" - 3/8" wide when complete and once I had gotten a few layers in I had to keep them consistent. I felt like all I did for a week straight was sew layers of tulle in-between other ongoings. Not a bad way to pass the time mind you, and I obviously love sewing, but it certainly required patience and care. Tulle rips so easily too and my heart would jump if I accidentally sat on a layer as I was getting myself set up at the machine. It was a lot of volume to keep under control so this would happen often. Once all my layers were ready to go I basted them on to the lining. I suggested bemberg rayon for the lining because it's so durable and has a nice satiny appearance. However, if you want an easier fabric to manage and a less luxe look underneath than any kind of cotton broadcloth would work just fine too. As long as it's not a cheap acetate or polyester you'll be fine. I wanted a dressier look to the waistbands too so I also suggested using the bemberg for this. I wasn't quite sure how this would work thought because it's also a very dainty fabric. I knew I would have to build it up using more than just a layer of interlining so I sewed in some interfaced broadcloth. In the end, it wasn't my favourite choice. It was difficult to manage and didn't behave as nicely as I would have liked. A sturdier satin would be more ideal for next time. There was definitely some challenges with this project but one of the main lessons I took from it is that with everything I learned in design school, and with all I've done since school, that I don't know everything about design and sewing. There is still lots to learn, lots to improve upon, and many more skill sets that can be added and refined. Not to say that I'm not a good sewer and a good designer right now but I certainly have my limitations. Tulle and the French seam are no longer part of those limitations though. In the end, the gals really loved the skirts, the fit is great, the colour combos are wonderful, and they look fantastic in them! And I just ADORE how they styled them in these photos. The crazy thing about these lovely frocks is that they really can be styled up or down. Fancy dinner? 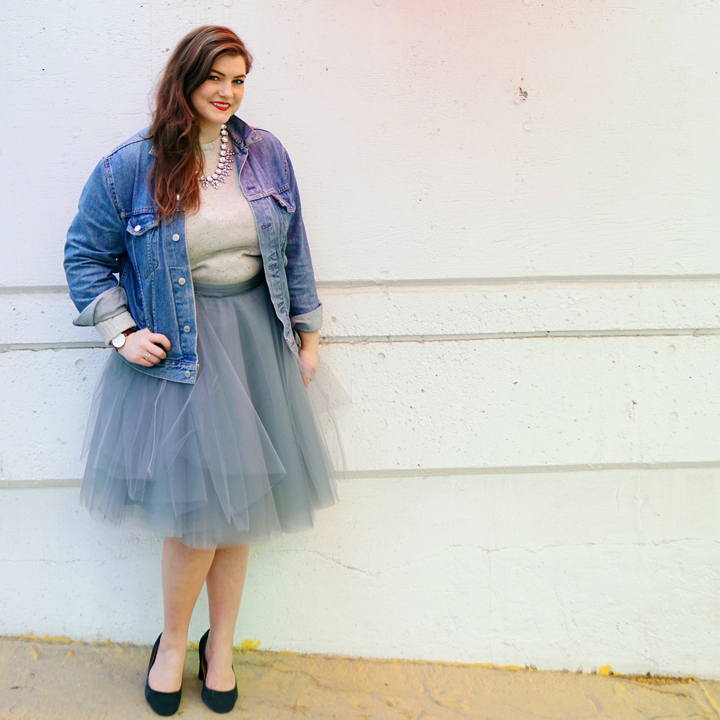 Tulle skirt! Casual coffee with friends? 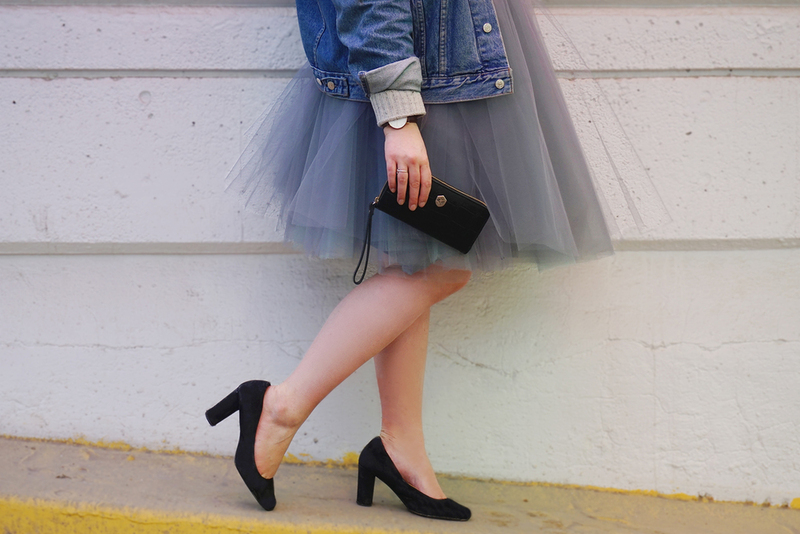 Tulle skirt! It's just that simple. I now have an urge to make one for myself too. *Looks at fabric shelf bursting with meters and meters of yet to be sewn projects*. But maybe I'll chip away at that fabric stash a bit first! At least I know that when the time comes I'll be able to handle another one of these with ease. And if you're asking yourself....should I make a tulle skirt? You definitely should! Or get me to make you one! Stylized photos are all courtesy of Marielle. Thanks so much for reading and happy sewing!